Welcome to the Week 13 Wide Receiver rankings! It’s a big week and I’ll be grinding the WR rankings a lot between now and the update—both for DFF and especially for seasonal. Hopefully you have clear cut choices, but if not, hit me up on Twitter for a second opinion. 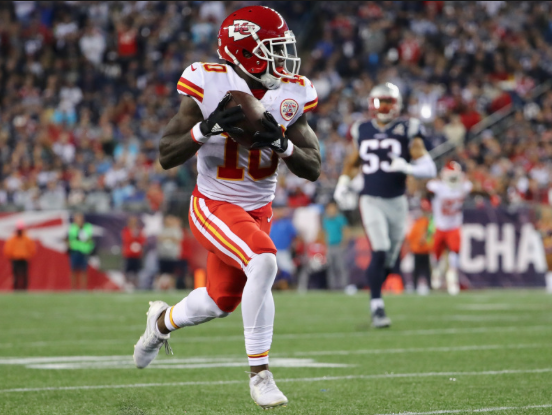 Tyreek Hill is in such a great spot but his price is a bit crazy for a wide receiver. My lineup construction may end up pushing me towards guys like Mike Evans, Keenan Allen, Julian Edelman and Robert Woods. There are some solid money-savers out there as well, like Corey Davis, Josh Reynolds and Chris Godwin. I’ll dig into all of this and probably ditch some of it when I do the Saturday DFF podcast. I’ll be back in a bit with the running backs and tight ends. 1 Tyreek Hill KC 9.100 KC@OAK 12/02/2018 04:05PM ET No way you are sitting him here. With Sammy Watkins likely out, he should be the source of a few big plays. 2 Adam Thielen MIN 8.000 MIN@NE 12/02/2018 04:25PM ET Diggs being dinged should lock in a huge target total. 3 Mike Evans TB 8.100 CAR@TB 12/02/2018 01:00PM ET Good matchup for him. Should get plenty of targets and should be active in the red zone. 4 DeAndre Hopkins HOU 8.200 CLE@HOU 12/02/2018 01:00PM ET A potentially tough matchup for him, but he’s almost matchup-proof at this point. 5 Julio Jones ATL 7.700 BAL@ATL 12/02/2018 01:00PM ET Tough matchup but he’s almost better in those as he sees some single coverage. 6 Antonio Brown PIT 7.900 LAC@PIT 12/02/2018 08:20PM ET Tough matchup (Casey Hayward) but he’s been a TD machine and his QB loves playing at home. 7 Keenan Allen LAC 7.200 LAC@PIT 12/02/2018 08:20PM ET Targets should be high this week with Gordon down. Allen has to be heavily involved for them. 8 Robert Woods LAR 6.900 LAR@DET 12/02/2018 01:00PM ET Even more dependable for fantasy now that he’s in the slot more often. 9 Davante Adams GB 7.900 ARI@GB 12/02/2018 01:00PM ET Targets are locked in as he’s the only truly dependable thing they have in terms of receivers. He’ll see a lot of Patrick Peterson, which is not great. 10 JuJu Smith-Schuster PIT 7.500 LAC@PIT 12/02/2018 08:20PM ET Had a strong game last week and has a tough matchup here. 11 Odell Beckham Jr. NYG 7.800 CHI@NYG 12/02/2018 01:00PM ET Tough spot for him but the talent usually gets something done. 12 Brandin Cooks LAR 7.000 LAR@DET 12/02/2018 01:00PM ET He should get lots of looks but he’ll have Darius Slay on him so some mild concern. 13 T.Y. Hilton IND 6.000 IND@JAX 12/02/2018 01:00PM ET Tough matchup but they can move him around some to free him up. Still viable. 14 Emmanuel Sanders DEN 6.300 DEN@CIN 12/02/2018 01:00PM ET He’s got a good matchup here. 15 Kenny Golladay DET 6.700 LAR@DET 12/02/2018 01:00PM ET Sounds like the Rams get Aqib Talib back this week, so that’s bad for Golladay. 16 Julian Edelman NE 7.100 MIN@NE 12/02/2018 04:25PM ET He looks great out there. They will need him this week. 17 Stefon Diggs MIN 7.600 MIN@NE 12/02/2018 04:25PM ET Has a sore knee but says he’s playing despite missing two practices. He’s downgraded a bit but I’m assuming he plays. Keep you head on a swivel with Diggs this week. 18 Josh Gordon NE 5.900 MIN@NE 12/02/2018 04:25PM ET Could see a lot of Xavier Rhodes though Rhodes is questionable with a hamstring. 19 Corey Davis TEN 5.500 NYJ@TEN 12/02/2018 04:05PM ET He can handle the Jets corners. He’ll have Morris Claiborne on him most of the day. 20 Tyler Lockett SEA 5.800 SF@SEA 12/02/2018 04:25PM ET Playing incredibly well—turning five targets a week into strong WR3 numbers and often better. He’s got a good matchup this week. 21 Tyler Boyd CIN 6.100 DEN@CIN 12/02/2018 01:00PM ET Tough matchup with Chris Harris in the slot. 22 A.J. Green CIN 7.400 DEN@CIN 12/02/2018 01:00PM ET If he plays, you play him, but there’s some concerns here because we are dealing with a tricky injury AND a QB switch. If Green plays close to a full load and produces, I’ll upgrade him next week. 23 Josh Reynolds LAR 4.900 LAR@DET 12/02/2018 01:00PM ET Should avoid Darius Slay and win his matchups consistently. Expect WR3 level stats. 25 D.J. Moore CAR 5.600 CAR@TB 12/02/2018 01:00PM ET It’s happening. One of my last “upside stash” options from 2018 is hitting. Moore had another strong outing in Week 12. He’s no played 45 or more snaps in five straight games. He’s a legit WR3/Flex play whether Funchess plays or not. 26 Calvin Ridley ATL 5.400 BAL@ATL 12/02/2018 01:00PM ET Tough matchup. 30 Doug Baldwin SEA 5.500 SF@SEA 12/02/2018 04:25PM ET He’s clearly not 100% so he’s a WR3 rather than the high-end WR2 we know well. He’s not listed on the injury report so he’ll be out there. 35 Taylor Gabriel CHI 4.200 CHI@NYG 12/02/2018 01:00PM ET Had a decent rapport with Chase Daniel last week so should see some targets and will not see any good corners. 37 David Moore SEA 4.300 SF@SEA 12/02/2018 04:25PM ET He’s clearly the third receiver now. Wilson likes him and is showing him serious trust. 44 Anthony Miller CHI 4.500 CHI@NYG 12/02/2018 01:00PM ET Chase Daniel at QB again is not great. 49 Devin Funchess CAR 5.000 CAR@TB 12/02/2018 01:00PM ET Limited practice (back), so still questionable for Week 13. 50 Keke Coutee HOU 4.700 CLE@HOU 12/02/2018 01:00PM ET Hamstring still an issue. 59 Jamison Crowder WAS 4.000 WAS@PHI 12/03/2018 08:15PM ET Still no practice. Assuming he’s out but you never know. ***UPDATE*** Got in a limited practice and may play. Has some risk, obviously. 65 Robby Anderson NYJ 3.500 NYJ@TEN 12/02/2018 04:05PM ET He’s not 100 percent. High ankle sprains are tough for players who rely on quickness and sudden breaks. 70 Nelson Agholor PHI 3.700 WAS@PHI 12/03/2018 08:15PM ET Has played a lot but seen a lot less targets with Golden Tate in town. Everybody has because the offense has struggled. If things heat up, the receivers will as well, but fir now, you can’t play Agholor outside of desperate situations. 101 DeSean Jackson TB 4.800 CAR@TB 12/02/2018 01:00PM ET Hs a thumb injury and may miss time or play less snaps. Be careful with him this week. ***UPDATE*** He’s out. 102 Michael Thomas NO 8.300 NO@DAL 11/29/2018 08:20PM ET (ALREADY PLAYED) A must start in Week 13, with so much on the line. 103 Marquise Goodwin SF 5.200 SF@SEA 12/02/2018 04:25PM ET Expected to miss Week 13 with peronal issues. 105 Amari Cooper DAL 6.200 NO@DAL 11/29/2018 08:20PM ET (ALREADY PLAYED) tough matchup, but at least he’s making plays in Dallas and being featured.